We had another massive and destructive tornado rip through here today (Monday, May 20, 2013). This time, the city of Moore was hit the hardest by a mile-wide tornado with winds around 200 miles per hour that destroyed entire neighborhoods, including two schools, within 40 minutes. The deaths are still being counted. Here is the actual KFOR video footage I was watching when this deadly storm approached Moore, Oklahoma. This is a recording of the local KFOR broadcast of the deadly Moore, Oklahoma tornado from its origination just outside of Newcastle to the final spinning rope nearly 40 minutes later near Lake Stanley Draper (near Tinker Air Force Base). We have been on alert for most of the day. While taking my daughter to school, I was thinking about turning around and just keeping her home. I ended up picking her up a little early and we headed home in one of the nastiest hail storms that I have ever been in. But the bigger danger was far enough away from us. The television was locked on News Channel 4 (KFOR) since yesterday. 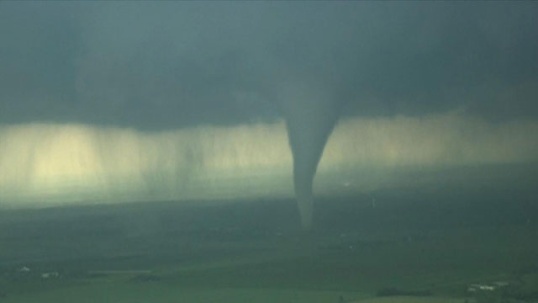 When I got home, I prepped my daughter for another visit to our storm shelter and I could hear Mike talking to "Bob Moore Chopper 4" about a tornado on the ground. He was calling out streets that the tornado was crossing and telling watchers and listeners to get underground or flee from it. As Mike called out some familiar streets near Moore, OK, I realized that it was the normal school pickup time and that many parents would probably be on their way to get their children. Schools lock down here in Oklahoma when tornadic weather is close, but there's no telling where parents are when schools lock down.